Your prayer request opens the door, and God is waiting patiently on the other side of that door, at all times, in all situations, to join with you. 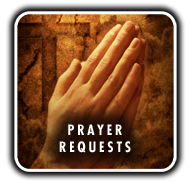 Your prayer request is received by our Prayer Request Team who will pray on your behalf. Please indicate if you desire anyone to contact you and leave us a phone number to call you.